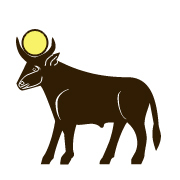 Iaru, the restful papyrus thicket that represents heaven, comes today with Mnevis, the perfect bull who is a messenger to the gods. If you seek perfection while you are here on Earth, your search will be marred at times by distractions and inconveniences. Rather than worry about being perfect always, remember that you have a messenger to the God of your understanding, which is your own prayers. When you have a pure heart any message you send to God will be received and your answer will be a marker for you to follow in your quest.